How I feel Physically: LOLOL Baby girl has dropped. She is in prime position. My ribs are feeling better at times. Probably because I am really taking it easy other than my daily exercise and my physical therapists are AMAZING. Not trying to do too much, because I can tell when I do I literally can barely function. That was the biggest change this week. I could literally sleep all day every day and never feel rested. How I feel Mentally: I feel good. I met a new midwife this week and she was wonderful and made me feel even better (not that it could have been much better) about whoever is in the delivery room with me, because they have all been so nice. I am really tired of being pregnant, but I guess she will come when she comes. I'm trying to be patient....even though it's almost impossible. Happy of the Week: 1. One of my favorite people had her baby this week! 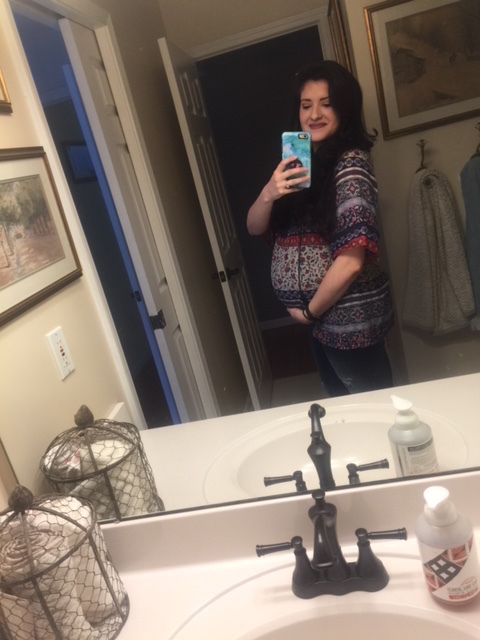 Taylor has been such a huge help during my pregnancy and I am so glad that we were on this road together! I will admit that I am totally jealous that she is already holding her sweet baby, but that is the path God put us on and I cannot wait for our sweet girls to meet! 2. My husband. He is always my happy, but man is he just wonderful. He has been loving on me in every way lately, and I am so thankful. 3. We went to a Newborn Basics class (the only class we signed up for haha) and it was just kind of fun to watch Logan put a diaper on the baby and to swaddle it. I think pregnancy has made me even more attracted to him (I didn't know that was possible). 4. Started deep cleaning the house and installed the car seat in the car and did some last minute things for Miss Clarke. 5. We also went to the AA farmers market and that just brings me all of the happiness! CRAVINGS: This week goes to Vegan Nut cheese (insert laughing emoji). I have been really enjoying this spread with Simple Mills crackers as a snack between breakfast and lunch. Things for Clarke: This week I bought her a Skip Hop Portable Changing Mat for diaper changes on the go! I also bought the matching paci holder. Favorite Dinner: We had TONS of good dinner this week. We went on date night friday and I chose a burger topped with avocado, a fried egg, and bacon with sweet potato fries. Saturday early afternoon we went to brunch and set outside and I had an omelet and logan has tamales! Then Sunday I cooked most of the day to prepare for the week and I made Bulgogi, Unstuffed Cabbage rolls with cabbage and tomatoes from the garden, and we made 4 loafs of zucchini bread! We froze 3 of them! Workouts: They were decent this week. I mean if you look at them, its not like they were difficult, but I got some decently long walks in this week, which I think is important to get baby to come and get ready! Sunday: 30 min swim laps. Felt really good to be in the pool. It feels so nice to be weightless and even though I am out of shape, it still feels good. Thoughts of the week: It was a good week. Exhausting, but good. I am so thankful that another healthy baby was brought into the world and I am thankful every single day for all of the people who love on us! Weight Gain: I weighted this week (38+2 I am aware that that is actually next week in this blog haha) and I didn't gain any weight from last week which was between 28-29lb weight gain. I think it's pretty normal. The baby has quit growing at a crazy pace, so it's normal to not gain weight in the end.